A detective's notebook, journalist's pad, activity book, and time capsule all rolled into one, Interview with My Grandma has everything a budding young investigative reporter needs to land an exclusive interview with the family VIP. Filled with questions about Grandma's origin story ("What year were you born? "), educational background ("What was your favorite subject in school? "), career highlights ("What are your three greatest achievements? "), and family secrets ("Do we have any famous relatives? 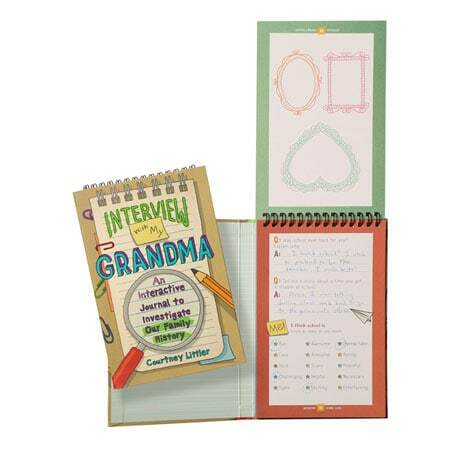 "), this spiral-bound notebook provides a fun get-to-know-you opportunity…especially for little ones who didn't know Grandma wasn't always a grandma! Once it's completed, this activity pad—which also includes space for drawing family portraits, playing word games, and practicing storytelling—is sure to become a cherished family keepsake.